NAMM 2011 PRESS RELEASE: Mackie today announces a complete redesign of its bestselling line of ultra-affordable powered studio monitors - the MRmk2 Mackie Reference Monitors. Featuring class-leading power with unmatched clarity and definition at its price point, the new series is sure to please those looking for a professional monitoring solution for project studios, edit suites and home theatres alike. "Mackie is well known for delivering professional monitoring solutions at affordable prices," remarked Mackie Product Manager, Matt Redmon. 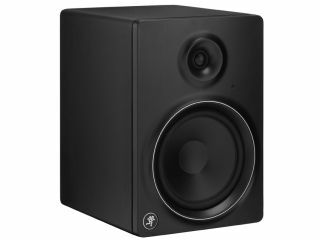 "Our new MRmk2 monitors deliver on all fronts, from an extended low-frequency response unmatched in their category, to the clear definition of mids and highs upon which engineers stake their reputations." Mackie MRmk2 studio monitors feature all-new professional transducers specifically designed to match their respective amplification. Both models employ a 1˝ neodymium magnet-driven soft dome tweeter featuring ferro-fluid cooling to help protect against power compression during wide dynamic playback. The 5.25˝ (MR5mk2) and 8˝ (MR8mk2) hyperbolic-curved cone woofers reduce severe cone resonances, drastically minimizing distortion. The powerful, precision Class A/B amplifier section features XLR, TRS and RCA connectivity, along with user-adjustable acoustic controls for simple room correction. The robust cabinet is rear-ported, reducing distortion, and features an optimally-sized custom Waveguide and molded baffle, offering balance to the HF / LF content while increasing both the stereo imaging and depth of field. The Mackie MRmk2 Series Powered Studio Monitors will be available worldwide February, 2011. The MR5mk2 will have a U.S. MSRP of $199.99 and MR8mk2 will have a U.S. MSRP of $329.99. Visit Mackie during NAMM in the massive new showroom upstairs in Demo Room 209A/B from January 13-16, 2011 in Anaheim, CA.